Shh. Don't tell Sophie that I'm letting you in on our secret. I'm about to burst, though, and I have to tell someone. Poor Horace Scroggins took a very bad fall off a balcony. I won't go into the gory details but while he was bleeding and getting closer to death, he told Sophie to retrieve something and that "she should never know." Sophie made a mad dash for it as soon as the rescue squad left. It turned out to be an old love letter. Sophie is my best friend in the world but that rat wasn't going to tell me a thing about it! I just happened to pick it up. It was a love letter from Brown Eyed Girl to Moondoggie! Is that adorable? It must be ancient. I had no idea that Horace was such a romantic. He must have kept that letter for decades. I know what you're thinking. Sophie said the same thing. We should just leave it alone. He didn't want his wife to know about it. I'm married, so I understand where you're coming from. But Edith Scroggins is so mean that she makes the Wicked Witch of the West look like a friendly puppy. The woman is horrible. I've never met anyone so disagreeable and dour. The thing is that poor Horace isn't doing very well. I think he wants us to find Brown Eyed Girl. This might be his last chance to ever see her. There's just one problem. Horace isn't able to talk. Without a name or address, how are we supposed to find her? Do you know how many women have brown eyes? Sigh. What do you think? Should we mind our own business or do a little sleuthing to see if we can find Brown Eyed Girl? 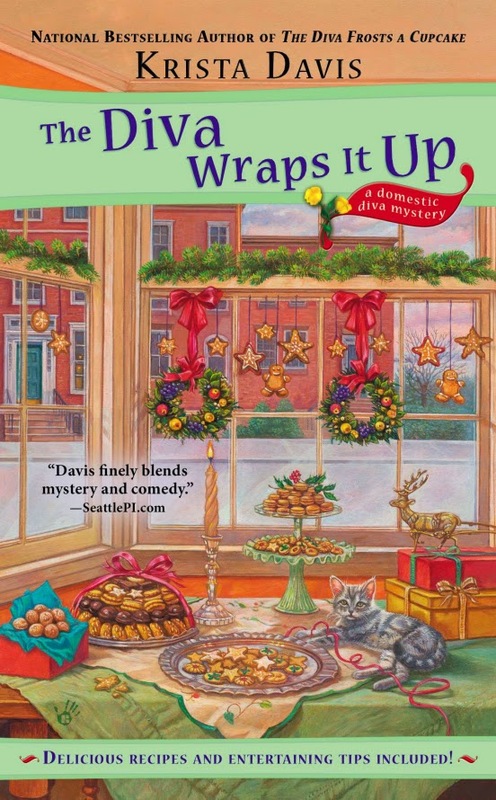 THE DIVA WRAPS IT UP won't be out until June 3rd, but Krista is having a contest. You could win a copy! One lucky person who leaves a comment here before midnight May 27th will win a signed copy to be shipped as soon as it's available. Good luck and be sure to leave an email address in your comment so Krista can contact you! Anxiously awaiting the arrival of your soon to be released book. You are a relatively new mystery book series author that I'm appreciating! I love this series and have been impatiently waiting for the next book. I'm still hoping for some kind of closure with Wolf and I hope there is a new love interest for Sophie soon - not sure who I would want to fill that slot. Sometimes I think Mars...but maybe they are better off just good friends. Counting the days until June 3rd! I love this series and am eager for the next book! I can easily guess at his age. My husband and I consider Brown Eyed Girl "our" song. As Nina's and Sophie's friend, I'm not eligible for the giveaway, but I have to give my opinion: There's no question. You have to try to do what you can! I love this series. Can't wait every year. Phoebe and I are waiting, Krista! The corgi is quite the fan and so is her mom! Thank you for keeping us so entertained! I'm in for some investigation fun! The Diva series rocks! Thanks Krista for giving me pleasurable reads! I keep entering these contests and I never win, so I'm not kidding around this time. I want to win. I love this series. Love it! Definitely do some sleuthing!! You owe it to Horace, don't you?!? Best of luck finding his brown eyed girl! Would love to win. Nice cover. So looking forward to this book -- would so love to win! Do a little sleuthing - absolutely~! Cannot wait to read this one. this series is in my TBR!!! Just finished "Murder, She Barked," and I can't believe I hadn't stumbled upon Krista Davis before this book. Loved Wagtail - and especially loved the way the book was written. Lovely setting, wonderful characters, super interesting story. I am SURE the Domestic Diva series is fantastic - and can't wait to get to reading them! Sleuth away!! I'm looking forward to following along. Love this series, can't wait for the Diva Wraps it Up! You've got to do some sleuthing---just so I can read about it. Thanks for the contest. Another Diva book onto my wishlist :) Keep them coming!! :) The guys and gals love this series at The Final Chapter reading group.